The Baltimore Ravens middle linebacker dishes out punishment like fresh bread at a soup festival. If you wonder why the 16-year veteran is still going strong, check out this workout. You're a rookie tailback for the Cleveland Browns. You've been riding pine all season, but the starter just went down with a broken clavicle. You're up. The QB calls your number: iso up the strong-side A gap. Your football life flashes before you: pee-wees with your dad, high school outrunning those chumps from across the valley, university where you broke records, tore your hammy and met all those girls, draft day, training camp, practice squad ... and this. Your entire life built to this moment, and you know with all certainty who awaits you on the other side of the scrimmage line, the abominable Ray Lewis. Lewis puts into question the life of every skill player on every team he faces. He's taken grown men to the ground 2,000 times in his hall of fame career (more than 1,500 solo tackles). He pulverizes receivers and smashes through blocks like a freight train through a phone booth. The 10-time All-Pro, 13-time pro-bowl linebacker has roamed NFL grids since 1996. He's a two-time NFL Defensive Player of the Year and the second linebacker in history* to win the Super Bowl MVP Award. 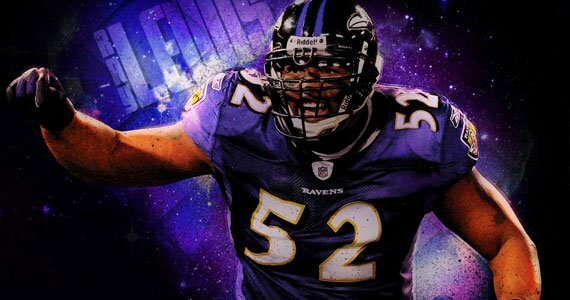 Ray Lewis is the baddest badass. Becoming one of the best linebackers to ever cleat a field isn't easy, and it doesn't happen by accident. Like any stage-worthy bodybuilder, Ray Lewis knows the importance of consistent training, nutrition and supplementation. He dials all three to max levels. He must reach peak performance whenever the pigskin flies. Even during the offseason, Lewis's life and livelihood depend on his athletic preparation and ability. Lewis is a legend for a reason. During the offseason, he rests on neither haunches nor laurels. He strives to better his performance each and every day. To get there, he personally develops his own plans. Most workout plans cover weight training and cardio; they cater to people training to lose weight or build muscle. The general populace schedules these workouts around work and commitments. Guys like Ray Lewis work out because it IS work. NFL work days can last as long as eight, ten, or even 12 hours (with breaks) or more when you include film study. Football players drill plays, moves, alignment, adjustments, footwork, handwork, and brain work. They lift weights, run coordination drills, lift weights, run cardio, stretch, lift weights, hit the training room (ice baths!) and then add more cardio. Nothing but world-class training is acceptable. You are required to train with world-class effort and intensity or you won't last a minute behind "The Shield." Athletes train more for function than aesthetic effect. Lewis said, "I can train and diet to make my abs look good, but my position calls for me to have a strong core, which means I need to focus more on function than looks." Lewis preached his entire career about the importance of healthy nutrition. The philosophy you hear him constantly reiterate is that "the body is a temple." He takes care of his body. He feeds it quality calories. He drinks at least a gallon of water per day, if not two. Lewis keeps his protein high to feed his muscles, spur growth and facilitate exercise and workout recovery. All of his meals contain carbohydrates, the body's preferred source of energy, to fuel the repeated sprints demanded by football. It's no secret that dietary supplements have come under a lot of scrutiny over the years, especially for pro athletes. One misstep can end a career. In some cases, even certain legal supplements are banned by the NFL, which makes the subject especially tricky to navigate. Ray Lewis uses only league-approved supplements. These are foundational supplements like a multivitamin, protein and pre-workout. Such products support the intense training and grueling practice of a pro baller. Lewis specifically uses a pre-workout formula from Twinlab, called Power Fuel. How hard does Ray Lewis train? Running backs and receivers steer clear of him on the playing field, and his friends avoid training with him in gym. It's too hard, too intense. This workout hits your entire body. Save for dips, every move uses dumbbells. He starts with 80-pound dumbbells and bumps the weight up 10 pounds per side for each subsequent set - until the fifth set, when he goes back to his original weight for a final burn set. Lewis doesn't rest between sets. He jumps rope or bounces on a mini-trampoline. "I don't train for a sport and I don't train to a number of reps," he says. "I train to failure." When all is said and done, workouts like this take the Baltimore Basher a good 120 minutes. *Chuck Howley was named MVP of Super Bowl V (1971) for the Dallas Cowboys.